At Jazmin Cakes we specialize in wedding cakes and understand the incredibly high standards you expect when it comes to an occasion as meaningful as a wedding. We look forward to the opportunity to hear about the unique details of your special day! 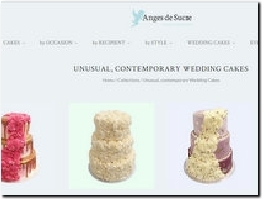 Luxury Wedding Cakes made by Anges de Sucre. Your dream wedding cake made in London and delivered to your wedding venue. One of the North West's premier designers of luxury wedding and celebration cakes. All our cakes are completely bespoke, we tailor each design to fit in perfectly with your occasion. Expertly matching your style, theme and colour pallet. MyFairCakery create amazing hand crafted wedding cakes and cakes for special celebrations, all dietary requirements are covered along with distance delivery. Contact Robin and her team today on 020 8874 4616 to discuss your ideas for special occasion cakes, cupcakes and cookies and make your next event extra special! 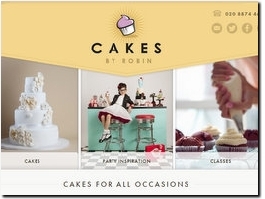 Cakes by Robin can deliver in and around the London area. 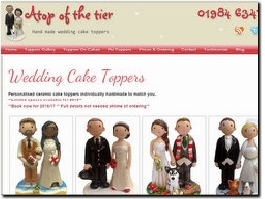 Cake toppers made to match you on your special day. 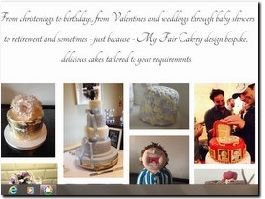 Creator of delicious wedding cakes in Essex. Amazing chocolate creations as well as elegant sponge and fruit cakes and cupcakes. In traditional or contemporary styles to suit your wedding. Beautiful bespoke contemporary wedding cakes and cupcakes for your perfect day in Kent and surrounding counties. We also have the largest selection of cake stands available for hire in the region. 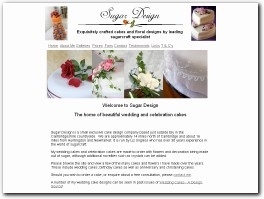 Sugar Design is a small wedding cake business situated near Cambridge. We offer beautifully designed and handcrafted wedding cakes and specialise in stunning lifelike sugar floral arrangements. Personalised cakes and cupcakes delivered directly to your or your venue. A range of size and recipe options are available including Gluten free and Dairy free. From engagement to the bridal shower and the big day, Shelle’s Bakes will help make your journey to wedded bliss a unique and tasty one! We offer bespoke Wedding cakes, dessert / sweet tables, favours and much more! Angie Scott Cakes provide Projection Mapped Wedding cakes for a completely unique wedding cake. As a wife and husband team with years fo experience in both industries, we have the knowledge and passion to make your cake the best! Sponges & Sparkles supplies the County Durham area with beautiful handmade Wedding Cakes. We are a home bakery, fully insured with a 5 star Food hygiene rating, qualified with years of experience so you can be assured of a high quality wedding cake. Caked Patisserie creates stunning bespoke wedding cakes for your big day, all made from scratch by Claire. Specialising in realistic sugar flowers, Claire will work with you to design your perfect cake to compliment your flowers, themes, even your dress. Texture Mats and Moulds is a newly-launched online cake store offering cake texture mats, chocolate transfer sheets, cake classes, PME course and a bespoke wedding cake service. As specialists in cake projection mapping, the Luma Bakery brings together digital technology and an artistic background in film and theatre to create unforgettable projection mapped cakes for weddings, parties and corporate events. 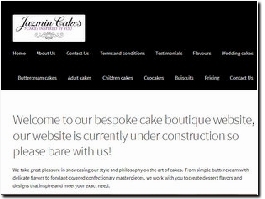 Gardners Cakery is a family-run business, established in 1910. We offer cakes for all budgets and sizes, so book a consultation today to discuss your ideas, or visit our portfolio on our website. 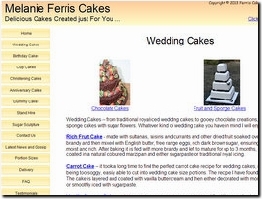 Gardners Bakery is a family-run business, established since 1910. We create wedding cakes for all budgets and sizes. Book your consultation today to view our Wedding Cake Studio or take a look at our extensive portfolio on our website. 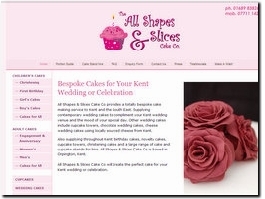 A bespoke cake service of the highest quality, based in Surrey and covering the South East. It is all about both the detail and the taste and Kate Sartorius ensures that each cake is tailored exactly to the requirements of the bride and groom. Created for any occasion, all HaPoly Ever After toppers are made with love and each one is specially created & personalised for you. No two models are ever the same, so you will know your toppers are truly unique. London-based bakery specialising in handmade, premium macarons. We offer favours, macaron towers and macarons for dessert tables. Our products are naturally gluten free, suitable for vegetarians and contain no artificial flavours or preservatives. We provide a fully personalised service dedicated to make you an elegant and very tasty wedding cake. Based in Gloucestershire but on the borders off Warwickshire, Worcestershire and Oxfordshire. We can design and create your dream wedding cake. Gluten and dairy free cakes available. We Specialise in Designing Beautiful Cakes,Exclusively For You. We Use ​​Traditional Recipes and Only The Finest Organic,Free Trade and Free Range Ingredients, To Create Cakes and Bakes that Taste as Delicious as They Look. Deliciously moreish cakes and bakes from Moo Moo Cakes. Naked or Iced, Allergy specific or Organic please contact me with your requirements and I''ll make your special day even more tasty! Not only do we hand craft every details of your perfect wedding cake, but we also cater for customers with intolerances, ensuring that everyone can enjoy an exquisite slice of your stunning wedding cake, without sacrificing the flavour. 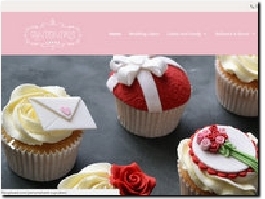 Taystful provides individually designed and decorated cakes and artisan chocolates in the Tayside and surrounding area. Please get in touch to discuss your requirements!